Sign up for a Free Trial! Prepare for PTE, OET, IELTS, and TOEFL Exam anytime, anywhere. Get a high score on your exam with E2Language’s full online English Test Preparation Courses. As an IELTS teacher and course designer, I have had a lot many test-takers ask me about the IELTS Academic Reading. So, here I’m going to go through a few of the most common questions I have come across and provided you with best tips and strategies to apply to some of the trickier IELTS Academic Reading questions. Do I have to read the whole passage from beginning to end? The answer is NO! The IELTS Academic Reading section has three long passages and they become increasingly more difficult as they go. That means, that the first one will be a bit easier than the second and that the last one will be more difficult than the second one. This means that if you spend too much time on the first passage (a mistake many candidates make their first time), you will likely run out of time before you get to the third and final passage. So, you don’t have to, and nor should you, read each passage from beginning to end. By now you’re probably asking, how do I answer the questions if I don’t read the whole passage? Well lucky you asked because that’s the next question! Can I answer the IELTS Academic Reading questions without reading the entire passage? Yes! I’ll let you in on a little secret: You can answer the questions without reading the passage from top to bottom because as you know, you will not have enough time to do this with all three passages. So, instead of doing that, you can apply certain skills and strategies that will help you. The two most important reading skills to know are skimming and scanning. You then use these skills to strategically answer the IELTS Academic Reading questions. Let’s look at each one of these and apply them to a practice question. Skimming is running your eyes over the text, or surface reading. You’re not looking for details, but just getting a general idea of what the passage or paragraph is about. Let’s try it with the Matching Heading question. Skim the passage below to find the general idea of each paragraph. Doing this will help you choose the correct heading. A. Many people enjoy swaying along to the music in a nightclub. For these extroverts, a night spent dancing and talking to friends is a fun evening. But for introverts, this is the stuff of nightmares. Small talk, dense crowds and loud music can be terrifying. Even partying at home with a group of friends, though fun, can be draining. Some people would much rather be tucked up in reading a book. This is a primary difference between extroverts who on the one hand who feel energised from stimulating environments and interaction, and introverts on the other hand who feel drained and low in energy as a result of such situations. 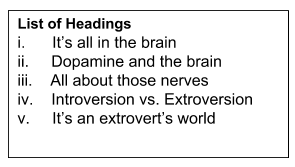 C. Another piece of the introvert-extrovert puzzle has to do with the nervous system. Both introverts and extroverts use both sides of their nervous systems at different times, just like they use both neurotransmitters. But extroverts tend to favour the opposite side of the nervous system; the sympathetic side, known as the ‘fight, flight or freeze’ system. This side mobilises us to discover new things and makes us active, daring, and inquisitive. The brain becomes alert and hyper-focused on its surroundings. Blood sugar and free fatty acids are elevated to give us more energy, and digestion is slowed. Thinking is reduced, and we become prepared to make snap decisions. 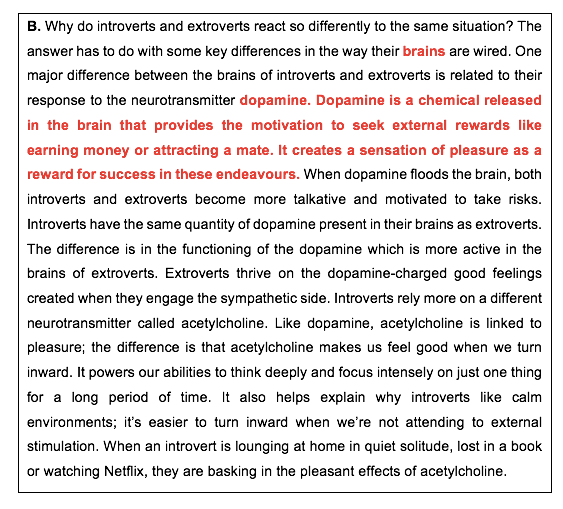 Without reading the whole passage in detail, but just skimming the surface, I was able to gather that paragraph A compared the difference between extroverts and introverts so the heading Introversion vs. Extroversion (iv) would be the most appropriate heading. I could also see that the first few sentences in section B mention the brain and brain chemistry, so I can safely assume that the heading It’s all in the Brain (i) would best capture the main idea of that paragraph. Finally, section C mentions the nervous system. Heading (iii), All About those Nerves best summarizes that idea. Remember, a paragraph heading is a one-phrase summary of the paragraph. Another important reason to skim is that you don’t have time to read the entire passage, and skimming familiarises you with the passage and where information is located. This is important because when you are looking for the answer to a question, you will know where to look! This will make sense when we look at the next reading strategy – scanning. Read the question and identify the keywords. Read the sentences before and/or after it. Go back to the question and answer it using the information you located. What is the role of dopamine in the brain? B It causes people to think deeply and introspectively. C It is responsible for the “fight, flight or freeze” response. D It is responsible for reward-motivated behaviour. You already know which paragraph the answer will be in! Because you’ve already skimmed the passage. The question here asks about the brain. Remember which paragraph talks about the brain? ….. Paragraph B. So, you don’t have to go looking through the whole passage to find the answer. Just go directly to the relevant paragraph. The answer is D – it is responsible for reward-motivated behaviour. The paragraph says: Dopamine is a chemical released in the brain that provides the motivation to seek external rewards like earning money or attracting a mate. It creates a sensation of pleasure as a reward for success in these endeavours. How do I manage my time to make sure I answer all of the questions in the IELTS Academic Reading section? This question is similar to Question 2, but it’s related more specifically to questions within a particular section rather than the whole reading section. If you come across a certain question that you are struggling with and is taking a while to answer (such as the matching headings question), you can leave it, continue with the rest of the question, and then at the end, come back to it. An important tip to remembers is that you don’t want to waste too much time on a tricky question and then lose time to answer the rest. Do I need to know a lot of academic vocabulary? Having a wide range of vocabulary will help you in the IELTS Academic Reading section. It is recommended that you read at least one academic article a day when preparing for the test. As you read, pay attention to new words – how they are used, as well as the words that surround them. This will help you understand how vocabulary and grammar work to give meaning to a sentence. As you read, use critical thinking skills to connect information, infer meaning and bring different ideas together to create meaning. How do you do this? Well, let’s look at an example text and short-answer question that would appear in the IELTS Academic Reading section. Take a look at the paragraph below. What are two things that are heightened to increase energy and hinder digestion? Firstly, let’s identify the keywords in the question: increase energy and hinder digestion. It is possible that you don’t know what the word hinder means. It would be helpful if you did, but if you didn’t, you can use some critical thinking to infer or guess the meaning from context. Plus, there are other keywords in the question that will help you, so use them when looking for the answer. So, you can see from the paragraph that hinder means to slow. You can infer this from the information given in the passage. Inferring (guessing from context) from his vocabulary will help you with the answer, as will using the other keywords in the question. What is the hardest type of IELTS Academic Reading question? The reading questions that I get asked most about is the True/False/Not Given question. So, let me break it down. Does the information in the statement match the information in the passage? So, what exactly does true, false, or not given mean? *The information in the two sentences contradict each other. Mozart is an important and influential figure in classical music → Mozart is the most famous classical musician = Not Given. *Mozart’s influence on classical music is stated, but it does not say he is “the most famous”. This information is not provided. Now you can practice and achieve a high band score in the IELTS Academic Reading section! Look at the paragraph below. 7 Introverts and extroverts rarely become friends with each other. 8 Introverts are energised by socialising at home with friends. 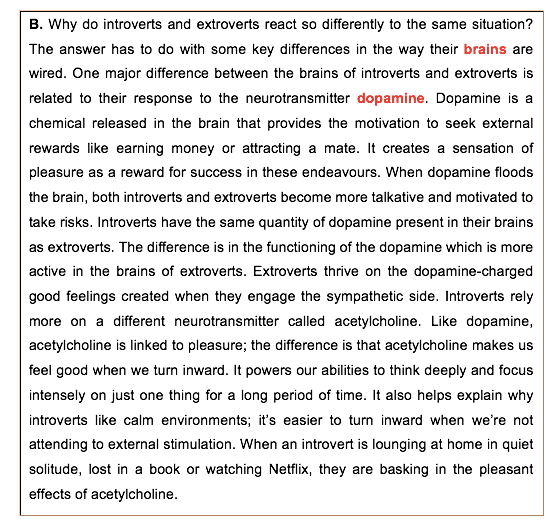 9 The main difference between introverts and extroverts is how stimulated they feel in lively environments. I hope that clears up some concerns you may have about the IELTS Academic Reading section. If you are an IELTS Academic test-taker, you can check out some tips on IELTS Academic Writing here. Hello Jay,i really love your videos.you are the best out there. I have a problem regarding Ielts Reading.I can’t finish all three passages on time . What should I do? I did attempt three times already and could not achieve 7.0 in reading . I have got more than 7.0 in all three sections., however, it takes 45-50 minutes for me to solve first two passages and then I don’t have enough time . I tried on practice – if I use about 70 minutes , I do finish and get more right more than 32 at least. So timing is my problem. And I don’t know how people does those skimming and scanning. I tried a lot of times by using these skimming scanning techniques . However my brain doesn’t understand the system I feel horrible and depressed in that very moment. So pleas help me. What should I do for the reading section. My level of English is not that bad. I understand most of the academic words too, but I have to read very slowly to understand those. Please Jay , Answer me.FYI, i am a medical doctor who wants to work in the UK as a practicing clinician. Bravo to the whole team! It was very well explained. Keep it up guys. Thank you for your support and positive words!